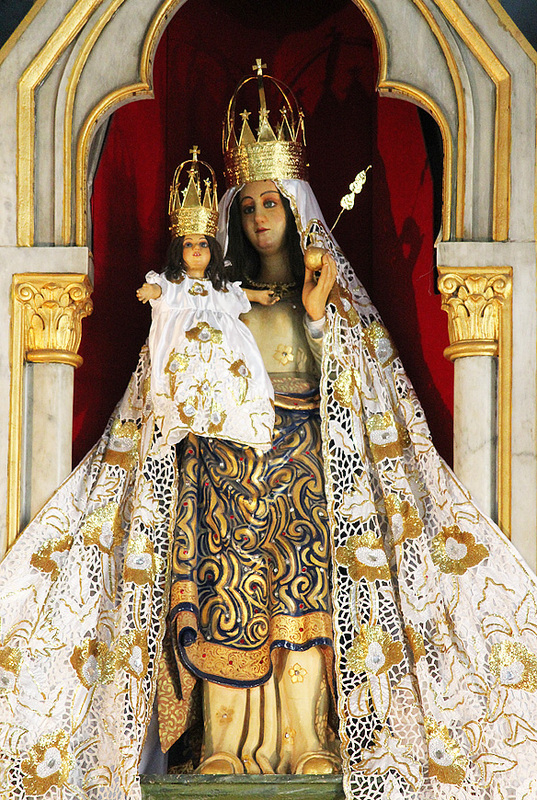 To a non-believer she is merely a wooden statue of Mother Mary in The Basilica of Our Lady of The Mount, brought all the way from Portugal to Bombay in the 16th Century. To a believer she has miraculous healing powers. The centrepiece of the Bandra Fair, people from all faiths, ages and social strata come to her to attend mass or simply sit in silence. Some walk down the aisle on their knees clutching wax offerings. Some chant the holy rosary in fervent whispers. Some just sit in silence [like me]. And some come waving colourful candles and are more excited about taking pictures with their cell phones of her beauty or of themselves with her in the background. Note: The Basilica of Our Lady of The Mount, where the effigy stands, was originally a simple mud oratory (1570) for private prayer. It morphed itself into the grand semi-Gothic edifice it is today on Mount Mary Road, Bandra West, Mumbai in 1904. This entry was posted in Global Travel Shot, Personal Musings and tagged Bandra, Basilica of Our Lady of The Mount, Churches in Bandra, Happy New Year by Rama Arya. Bookmark the permalink. Love the Our Lady of the Mount Cathedral and love the way the Lady of the Canon Mount Camera (or is it Nikon?) writes this blog!!! ⛪🎄✝ Happy 2⃣0⃣1⃣7⃣!!! Wishing you a wonderful year ahead too, Aadil, full of blessings and opportunities. Btw the lady is a Canon. 🙂 Thank you for your kind words for my blog. Means a lot. Thank you for stopping by, and reading my blog, Natasha. 🙂 I read your blog. You write well. Good luck for your blogging journey, and in spreading positivity! Thank you, but am not a Mister. Am a Ms. 🙂 Nice to know you enjoyed the post. Hope you enjoy the rest of my blog too. Enjoyed your post. Every word of it. There is so much of “me” in you. Loved it. A bit of me in everyone. A bit of everyone in me. After all, we are all connected! 🙂 Glad you enjoyed the post. Happy New Year. That was a nice one Rama Arya! You wrote well. I enjoyed reading your post. Happy new year 🙂 Hope this year is good as well. Thank you for stopping by and your kind wishes. 🙂 Glad you enjoyed the post. Happy new year to you too. May it be filled with travels, learnings and beauty.